Deciding the treat for the week is one of my favorite parts of making the menu plan. I always anticipate eating that deliciousness. I usually plan on baking two items, one dessert and one muffin/quick bread for us to snack on through the week. 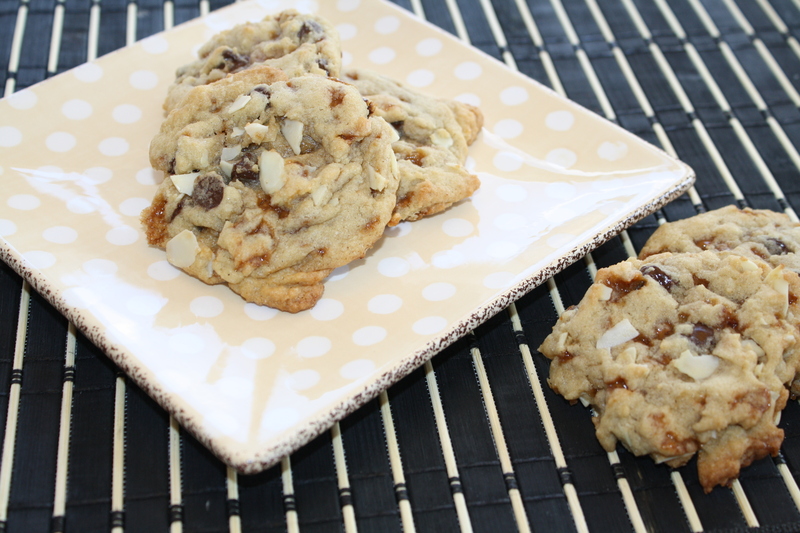 I originally only chose this cookie recipe because I had half a bag of skor bits in my pantry that were getting rather old. I am so glad I did though, because these were some of the best cookies I have ever made! 1. Beat together the butter and both sugar until creamy. Beat in eggs and vanilla. 2. Mix in flour, baking soda and salt. When combined beat in the chocolate chips, toffee bits and almonds. 3. 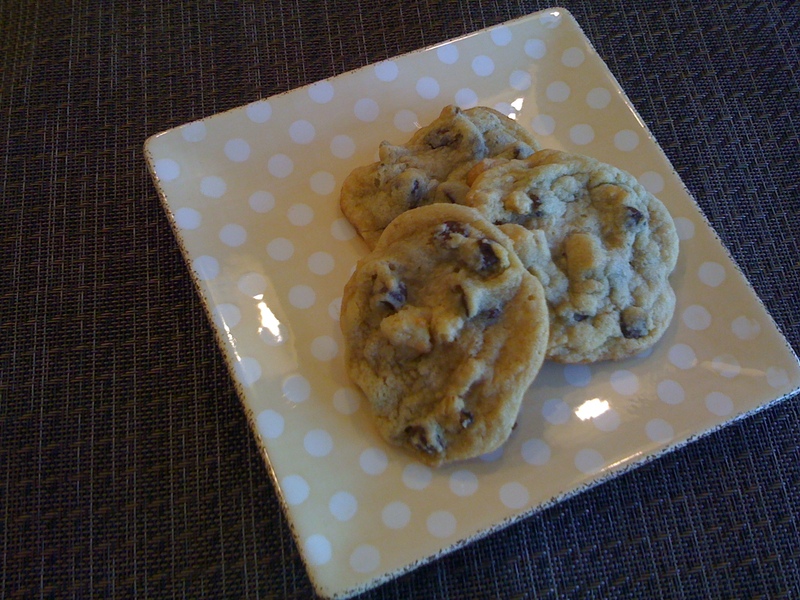 Scoop onto cookie sheets ( about a tablespoon of dough for each cookie). Bake at 350 degrees for 8-14 minutes. (8 minutes was good in my oven). Is there anything in the world better than homemade cookies? Muffins are right up there as well for me, cake is pretty close, but I really love cookies. The ultimate comfort food, in my opinion. 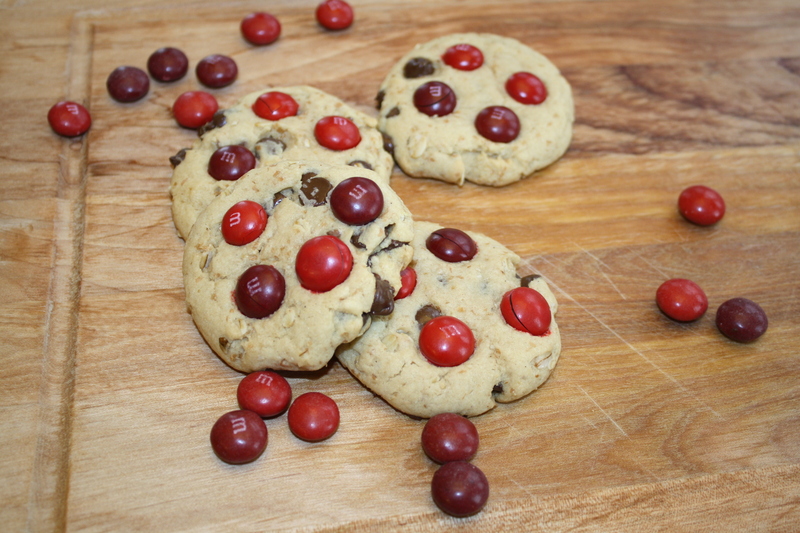 One of the best things about cookies is they are so versatile, so no need to ever get bored while making cookies! When I saw this recipe over at Beantown Baker I knew I had to make it, for two reasons. First, I love M+M’s in cookies, second I still had a giant bag of Cherry M+M’s in my chocolate hiding spot from my last trip to the states. They were love at first bite! 1. Beat the butter until creamy, add both sugars and beat. Beat in eggs and Vanilla. 2. Beat in the baking soda, salt, cinnamon, and one cup of the flour. Beat in remaining flour. Beat in oatmeal and chocolate chips. 3. Slightly round a scoop of dough and place on cookie sheet, gently flatten. Top with 3-4 Cherry M+M’s. 4. Bake at 350 degrees for about 10 minutes.